There is a vast amount of silk bed linen on the market today ranging hugely in both quality and price. Knowing what to look for can be a daunting task. Here are a few of our FAQs that if followed will ensure you buy a quality silk bedding product that will last. What type of silk do I need? 100% mulberry silk.There are many varieties of silk on the market. When purchasing silk bed linen insist on 100% mulberry silk. Only 100% mulberry silk consists of a continuous strand of silk. Wild silk, commonly known as Habotai silk is often passed off as mulberry silk but is never of the same quality as mulberry silk. Habotai or China Silk as it is sometimes called is often made up of broken strands of silk and non-silk fibres and is more suited for silk scarves and items requiring shorter fibres. Habotai silk does not have the same durability as 100% mulberry silk. 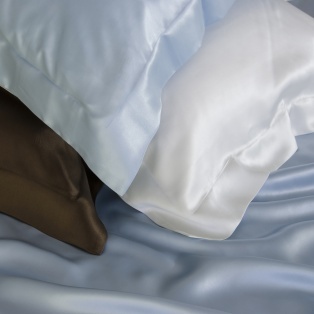 Only 100% mulberry silk can offer the consistency & durability required in quality silk bed linen. All our products are 100% mulberry silk, including mulberry silk pillowcases, silk duvet covers and silk bed sheets. A thread count of 400 or more. When considering making a purchase of silk linen, always check the thread count. The higher the thread count, the tighter the silk is woven. An ideal thread count for silk linen is above 400. Anything lover than 400 will not be as durable and not last as fine silk linen should. You may have heard of momme when purchasing silk items. Momme is the gauge used to determine the physical weight of silk. The basic measurement for momme is weighing a piece of silk that is 100 yards long and 45 inches wide. If the total weight comes to sixteen pounds then the silk will be graded as 16 momme. If the silk is heavier then a higher momme grade will be given and vice versa. To find out more about thread count, momme and GSM, follow to the Silksleep blog. What momme weight do I need? We recommend and only sell silk bed linen with a momme weight of 19. Silk with a lower momme number will have physically less silk in the item than one with a higher number. Your silk bedding should have a high momme number, at the very least above 12. 12-19 Momme: Is used for silk bedding but silk bedding with a momme of 19 will be more durable and easier to care for than say a momme of 14. 22 Momme & above: Durable enough for a tailored suit. Are Silksleep products listed in any directories? Yes, we are proud to be featured in the Builders Directory, Beauty Blog Directory and Directory World amongst others.